Big Sky GC in Pemberton. There are times when a golf course architect needs to pull out his box of tricks and get creative. Given a flat, barren piece of land and instructed to build a quality course, he needs to use his skill and imagination - and probably a sizeable amount of his client’s cash – to come up with something playable, enjoyable, and memorable. Then there are times when he must allow nature to create the adventure, and just let his surroundings take center stage. Natives of Colorado know something about beautiful golf courses, so they will appreciate the splendor of places like Greywolf in the tiny resort town of Panorama, Tobiano in Kamloops, and Big Sky in Pemberton. These, and their close neighbors, are among the most beautiful tracks in the world; courses where the quality of your ball-striking and the score you post probably won’t be what you remember most – unless you shoot 64, of course. The one exception to the ‘less is more’ approach is Furry Creek on the Sea to Sky Highway midway between Vancouver and Whistler. Working for a Canadian subsidiary of a development company based in Japan where it’s not unusual to find railways and pulley systems transporting golfers around courses built on severely-graded slopes, Robert Muir Graves created an extraordinary mix of holes overlooking magnificent Howe Sound that might not get the architecture aficionado’s blessing but which you’ll never forget, and which every golfer should experience at least once perhaps. 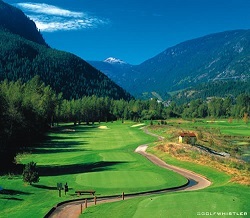 Furry Creek is owned and operated by GolfBC, the largest firm of its type in western Canada. Also included on its 12-strong roster are Nicklaus North in Whistler, Mayfair Lakes in Richmond, two courses on Vancouver Island and four in the Okanagan Valley. This year the company will be offering a number tempting stay-and-play and multi-round packages, and rolling out a number of initiatives aimed at attracting more beginners, juniors, and families on to the course - plans that include Quik Tees which shorten each layout to roughly 3,000 yards, and from which kids can play for free with a paying adult. Anything that gets more people playing this great game is to be encouraged. But there is just one problem - beginners that get their first taste of the game in British Columbia, be it in the Lower Mainland, the Okanagan, the Kootenay Rockies or further north in the Caribou, may be disappointed when they play anywhere else.